Nice International is a major hub in the South of France with 24-hour operations. It is also the best way to access Monaco, should you be continuing your journey aboard a yacht. It can get particularly congested throughout the summer but tends not to have any issue with capacity, due to the many executive handling agents to choose from. 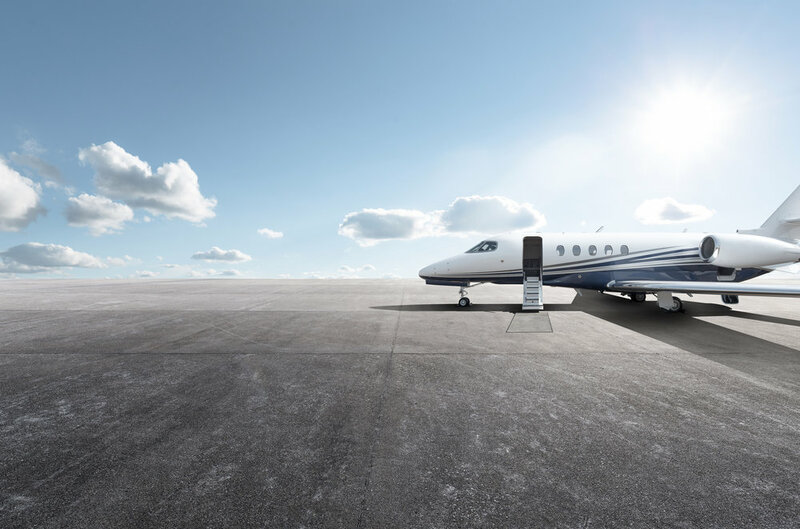 These include Aviapartner Executive, Swissport Executive, Landmark Aviation & Signature Flight Support. If you have a preferred handling agent simply let us know and we will be happy to arrange this on your behalf. Additional costs for changing to a different handling agent are covered by your fully inclusive pricing. Cannes Mandelieu Airport is a great access point for the Antibes region. It is also superior to Nice in that it is exclusive to private jet & helicopter operations. However, please bear in mind it has a much smaller runway compared to Nice Airport and therefore is sometimes subject to weather conditions on the day of flight. This mainly pertains to heavy rain and the effect it has on braking performance of the aircraft. Should this happen, Nice is typically the best alternative. The airport is open during daylight hours although the exact times vary from season to season. Contact your Account Manager if you wish them to investigate your intended schedule. Have you considered using Toulon Hyères Airport? A Naval base located to the West of Cannes, it is the preferred access point for St Tropez and the surrounding areas. Due to it being a military airport, it is mandatory to give 48 hours’ notice and prior permission is required. Similarly to Cannes, it offers exclusivity compared to Nice Airport and is not subject to the same weather issues as Cannes airport. You will find the drive time to St Tropez much shorter and it is certainly worthy of consideration if you haven’t used it before. Being the only airport on the island, Palma airport acts as the gateway to Mallorca. The island sees a huge surge in demand during July and August. If you want to avoid the crowds, the island is less busy during the shoulder months of May, June, September & October. Airport slots can be an issue with Palma as there is a lot of commercial traffic and just a two runways to serve all aircraft. Early booking is essential to secure you preferred schedule and weekends are best avoided – Saturdays are typically the busiest. On the day of your flight be prepared for Air Traffic Control to place restrictions on flight plans, which are only announced 2 hours prior to departure. It can be confusing as the word ‘slot’ is used many times, but an airport slot and air traffic control slot are two different things. Whilst we may have an on time airport slot, Air Traffic Control are the controlling force in these circumstances and instructions from them must be adhered to. In order to minimise delay please arrive no less than 20 minutes prior to departure to ensure prompt boarding. If you miss your allocated slot it can have an impact on our ability to get you away quickly. Ibiza follows the exact same pattern as Palma de Mallorca (see above). One point to note is that we regularly see requests for weekend visits, whereas Mallorca tends to be for those staying a little longer. This means that many aircraft request permission to park the aircraft from Friday to Sunday. Being an island space is at a premium, so it is unlikely this permission would be granted during the peak season of June through to September. In order to fulfil your request we would usually arrange for you to land at Ibiza before moving the aircraft to nearby Valencia or Barcelona. The additional positioning tends to cost around 5,000 EUR. In this situation, Air Partner covers the extra cost as we never charge you for positioning flights, thanks to the premium terms of your JetCard programme. We would of course prefer to park the aircraft in Ibiza if it was our choice. However, this is left to the airport authority to manage available parking space and outside of our control. Please bear in mind that the additional positioning flights are also subject to the same Air Traffic Control restrictions issued 2 hours prior to departure. Our Operations team are fully contactable 24 hours a day, 365 days a year if you have any concerns. In order to minimise delay please arrive no less than 20 minutes prior to departure to ensure prompt boarding. If you miss your allocated slot it can have an impact on our ability to get you away quickly. We tend to see very little disruption in Menorca so this would be my suggested entry point if you are meeting a yacht. Whilst I appreciate islands by their nature tend to offer one route in and one route out, this suggestion does work for those not planning to visit Ibiza or Mallorca specifically. This airport is the nominated airport for all private jet flights accessing Rome. If you are connecting to a commercial flight from Rome Fiumicino then you should allow up to 45 minutes for the drive. Italian traffic means the journey time can vary, so please check with your Account Manager when making your reservation. Rome Fiumicino will only allow private traffic for 1 hour in the early morning and 1 hour late at night and only with special approval from the authorities. Naples is the preferred choice for those visiting the Amalfi coast and the island of Capri. It is a heavily slot restricted airport dealing with both commercial and private traffic. Parking and slots are in high demand so please ensure you book in advance to avoid disappointment. Florence is the ideal airport to access Tuscany. Whilst the airport authorities will never confirm slots in writing until 24 hours prior to the flight, it is rare to find any severe issues unless there is a large event taking place. However, please bear in mind it has a much smaller runway and we can only approach the runway from one direction (as opposed to using both ends at most airports). Therefore, it is sometimes subject to weather conditions on the day of your flight. This mainly pertains to the winds on the day. Should they be blowing from the ‘wrong’ direction and creating a tail wind, it can make the approach unsafe and the Captain will take action to divert. Reassuringly this is rare, but worthy of consideration. Should this happen then typically Pisa is the best alternative. The private terminal is open during daylight hours although the exact times vary from season to season. Contact your Account Manager if you wish them to investigate your intended schedule. Olbia is a popular destination to commence or terminate a yacht charter, but like most islands it is a heavily slot restricted airport dealing with both commercial and private traffic. Parking and slots are in high demand so please book in advance to avoid disappointment. If you are flying to Sardinia, we tend to find it easier to use Alghero airport, so this would be our suggested entry point if you are meeting a yacht. Cagliari is also convenient should you be visiting the south of the island. By far the most popular request amongst our members, these airports are overwhelmed each and every year. The advice here is to book early and be open minded to slots issued by the Greek authorities. Everything from available parking, fuel trucks and space in the terminal is at a premium. On the day of flight be prepared for Air Traffic Control to place restrictions on flight plans which are only announced 2 hours prior to departure. It can be confusing as the word ‘slot’ is used many times but an airport slot and air traffic control slot are two different things and whilst we may have an on time airport slot Air Traffic Control are the controlling force in these circumstances and instructions must be followed. In order to minimise delay please arrive no less than 20 minutes prior to departure to ensure prompt boarding. If you miss your allocated slot it can have an impact on our ability to get you away quickly. As another popular island, the same situation applies as described for Palma, Ibiza and Mykonos. However, one point that is worth mentioning is that non-scheduled night flights are banned due to nesting sea turtles on the beach close to the airport. The approach pattern is altered to avoid this eco system but the lights on the aircraft can affect the success of this species and so the rule is rigidly enforced. Until recently this was the airport of choice for approximately 75% of all London requests. However the military base has recently been closing the airport at short notice, sometimes as little as 3 hours prior. This can lead to last minute diversions and has put many members off the airport, as peace of mind is key when flying privately. The reason is often cited as ‘short staffing in Air Traffic Control’. At the time of writing we do not know when this issue will be resolved. Aside from this, due to the military operating there it is mandatory to give 24 hours’ notice and prior permission is required at all times. The airport is now operating reduced hours until further notice. Farnborough is one of the most pleasant private terminals in the UK and an excellent choice for anyone accessing West London. A PPR (permission number) is required to access the airport, highlighting how tightly controlled the airport is in order to ensure security and privacy. The airport is open 0800 – 2200 Mon – Fri and 0800 – 2000 weekends. Delays may be possible in the week leading up to the air show and for two days post show. Luton is the best choice for those wishing to access north or central London with a drive time of only 45 minutes to Camden and 1 hour into central London. The airport has seen a surge in demand since RAF Northolt began closing at short notice and subsequently slots can be in high demand at weekends. In addition, Luton Airport breached their night time noise contour in 2017 and forecasts show they will continue to do so until at least 2021. Therefore, the airport has been forced to apply the following restrictions this summer between 1 June and 30 September and for the same date period for the years to come. London City airport is the most convenient airport for the financial district of the London. Popular with business travellers, it offers a compact but elegant lounge facility. However, please bear in mind it has a much smaller runway and is surrounded by water. Only specially trained crew and certified aircraft can use the airport due to the steep approach required. London City is subject to weather conditions on the day of flight. This mainly pertains to heavy rain and the affect it has on braking performance of our aircraft. Have you considered using London Stansted? Before the 2008 financial crisis this was an incredibly popular option for business travellers. Only 40 minutes from London City airport by car, it offers motorway access as opposed to the congested streets of the capital. With many private terminals and the ability to obtain slots with ease it is often overlooked compared with nearby Luton Airport. The airport is investing in some maintenance this summer between 2300 - 0600 local but still allowing 10 aircraft per night to operate.